You thought this was another Pinterest hack didn’t you? Surprise! No Pinterest here. It is YouTube! OK fine so now I follow them on Pinterest too but that came after, I swear! This post is partly about the individual video on organizing your dresser and partly about how much I am loving the Clean My Space channel. First the video. My t-shirt drawers have been bothering me for ages. It seems that no matter how many times I rearrange things they always end up being a huge mess the minute I need something that isn’t at the top of the pile. In the video (linked here) she shows you how to fold your shirts so that they are piled up but stacked from front to back. 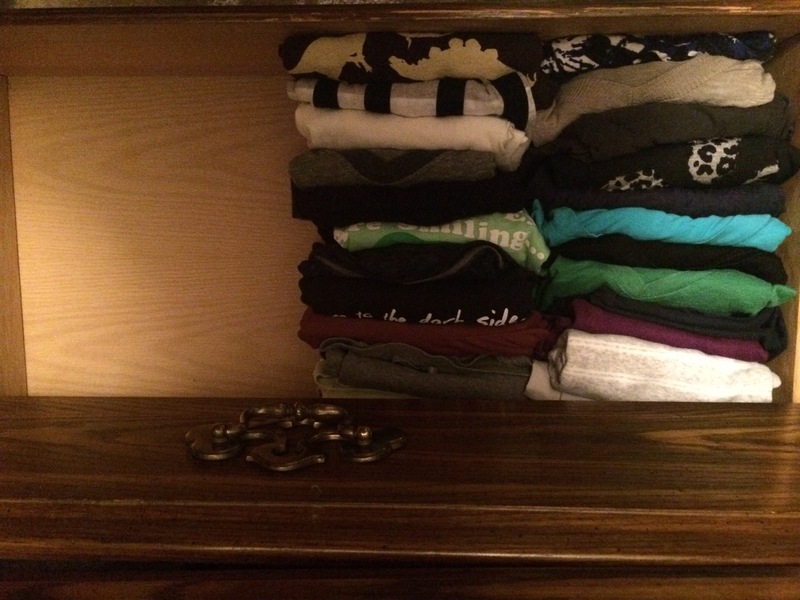 Not only does this make it easier to grab a shirt without messing up the whole pile, but it makes it easier to see what you have. I for one had forgotten about more than one shirt in my stash simply because they got shuffled to the bottom and I didn’t feel like digging them out. I redid my short sleeve drawer (ones that are appropriate for going out or work) and my sleep shirt drawer (you know those shirts you get for being in whatever college activity) in under 20 minutes. That is over half my drawer space done in less time than it takes chicken to bake. Love it! Look at this drawer, I mean look at it. I have space for twice as much as was in the drawer before and I can find anything immediately! Second the channel. I found this channel as one of YouTube’s suggested videos. I think the first one I watched was on top things people forget to clean. I liked the talking format (not full voice over) and how they weren’t unrealistic time commitments. The videos are tips to make you cleaner in LESS time, and who doesn’t love that? Another thing I have been enjoying the more I watch the show is that it doesn’t feel staged. They don’t fake a major “mess” but show cleaning a realistic example like a burnt pot, a dirty couch, or actual messes under the fridge. I find the hostess and messes to be relatable, realistic, and most importantly applicable to my life style. If you are looking for ways to have a cleaner home and spend less time doing it, I cannot recommend Clean My Space enough. They have a YouTube channel, Pinterest account, and all the other social media too. For full disclosure, I only follow them on YouTube and Pinterest.